Popeye - free program for solving. New versions, since 4.69. 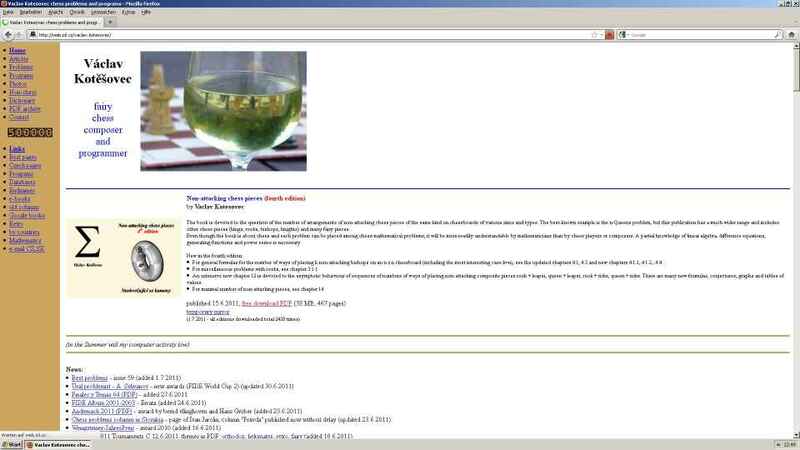 APwin - shell for Alybadix (and now also for Popeye) by Paul H. Wiereyn. New version APwin v2015-November. 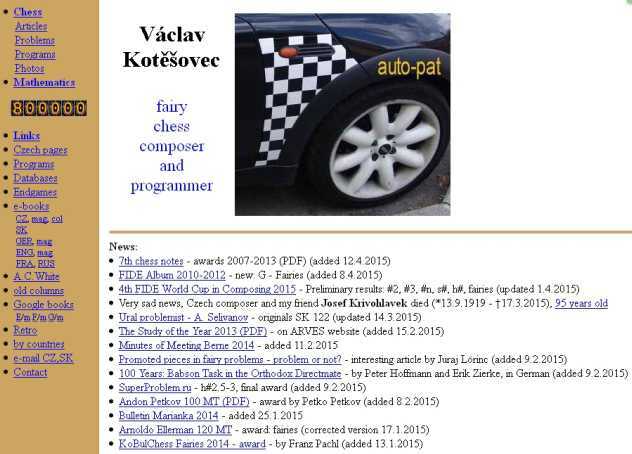 ChessComposer 5.1 - The first ever Chess composition app for smartphones (by Diyan Kostadinov and Dimitar Ivanov). 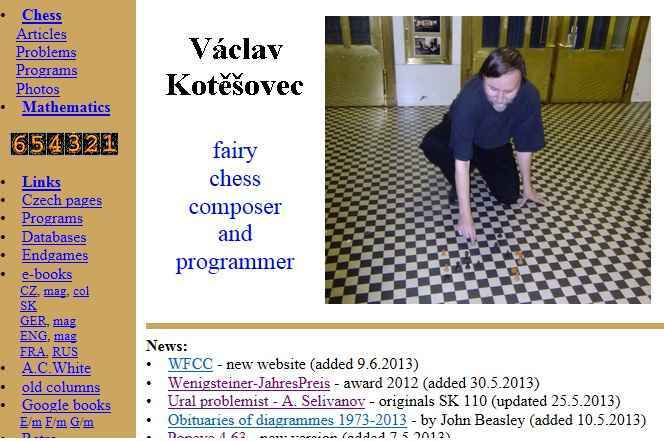 The Problemist - new editor of fairy section is Seetharaman Kalyan. 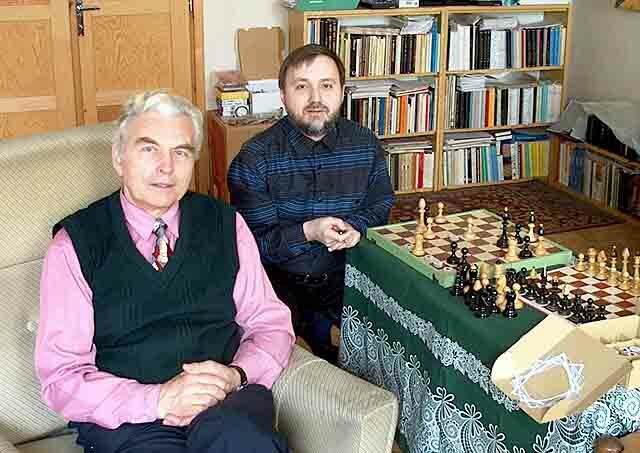 Kunstschach - Swiss Chess problem association, also problem and studies pages of Schweizerische Schachzeitung (complete 1900-2015 !) and Schweizerische Arbeiter-Schachzeitung. Magazine idee & form. Phénix - Concours de démolitions - new idea: tournament for cooks! EG - study magazine - all issues 1-156 (1965-2005) in PDF format, total 823 MB, 6410 pages! (also issues 153-156, see my list of all files (zip)). The Problemist Supplement - complete archive of PDF since 1992 (total 1194 pages)! RIFACE 2017 - award by Laurent Riguet and Jérôme Auclair (added 13.6.2017). compositions tourneys (J.Golha) - sorted by closing date and with table of stipulations. 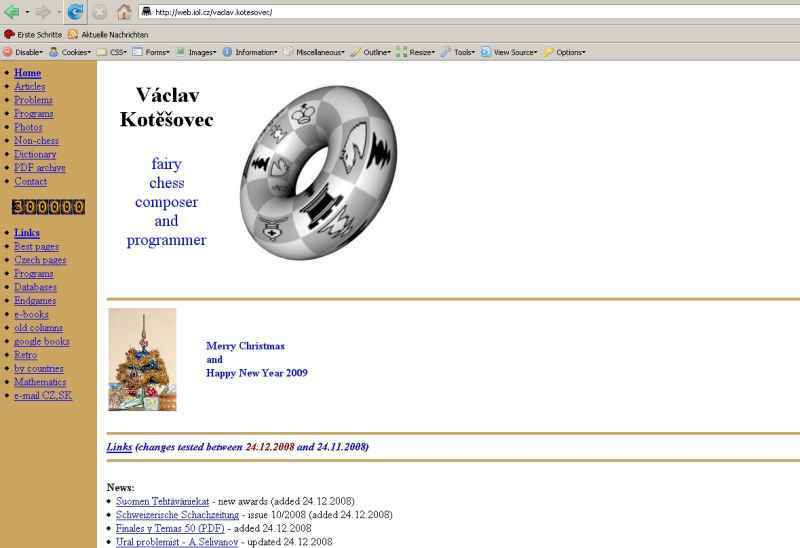 GUSTAV - fastest program for orthodox selfmates and moremovers - all orthodox selfmates in 8 moves from WinChloe database now tested! (added 6.10.2009, updated 21.10.2009). Examples of tested selfmates - updated 28.6.2010, 5 cooks in 1. Prizes (long selfmates) found. 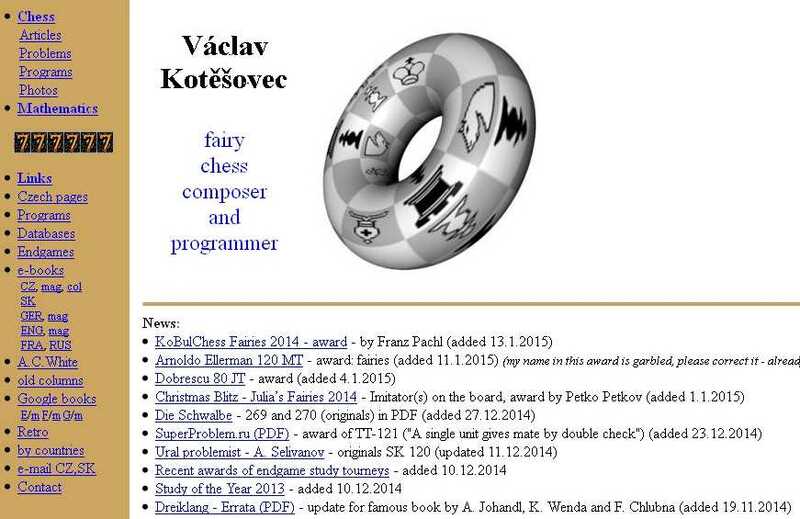 Fairy chess endgames - new results 2008 (PDF) - "Electronic edition of chess booklets by Vaclav Kotesovec", volume 2 (added 14.5.2008, corrected 25.5.2008). 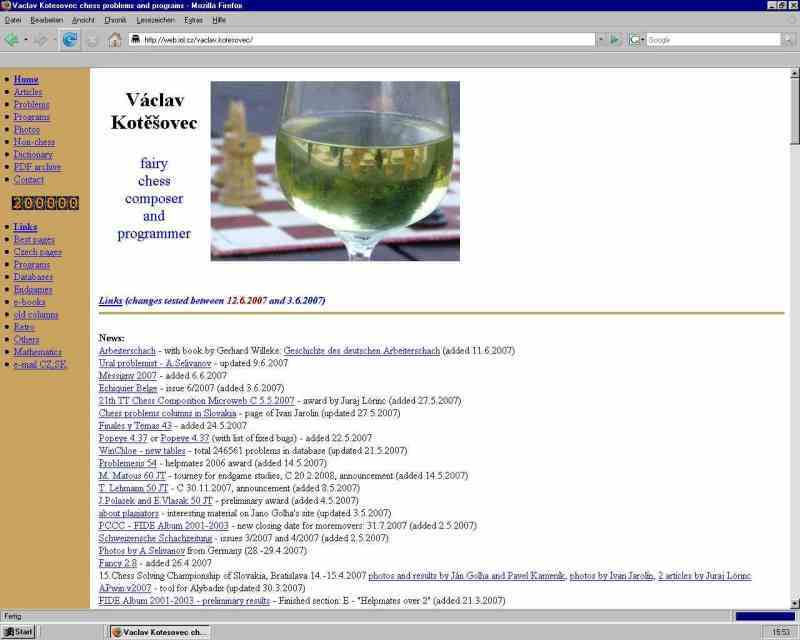 In September 2008 downloaded 2727 times! 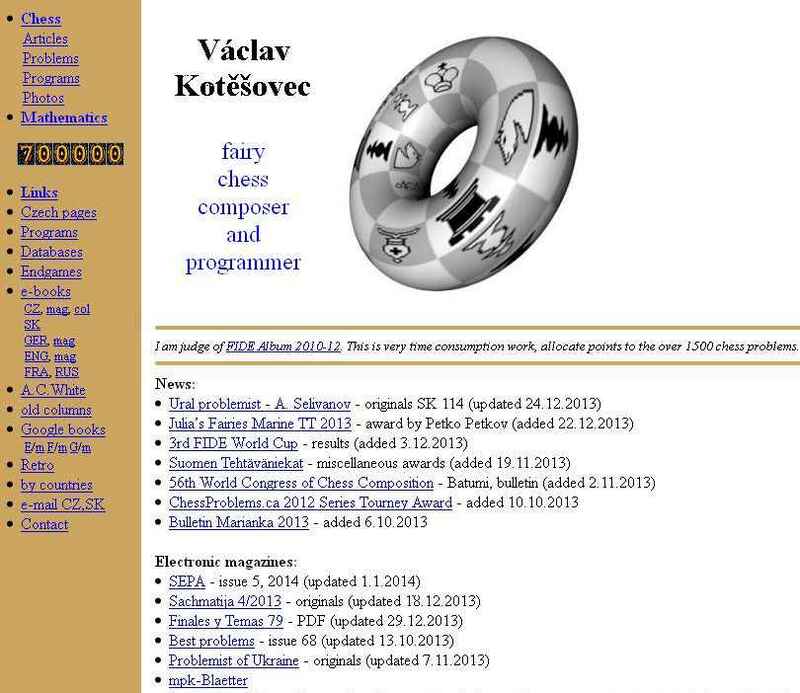 Vaclav Kotesovec: 30 years of cyclical pin (1977-2007) - PDF - "Electronic edition of chess booklets by Vaclav Kotesovec", volume 1 (added 8.11.2007, corrected 20.11.2007). In period 8.11.2007-30.9.2008 downloaded 2275 times! 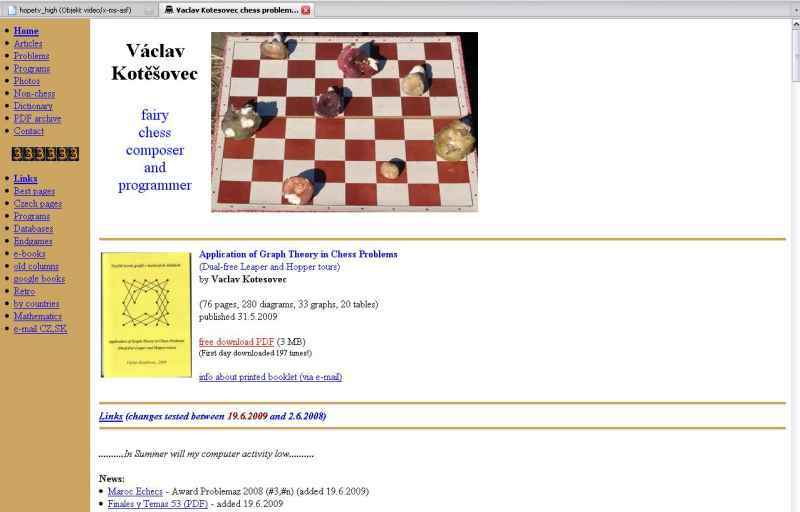 Summer mathematical problem by Vaclav Kotesovec - added 9.8.2007, PDF version. 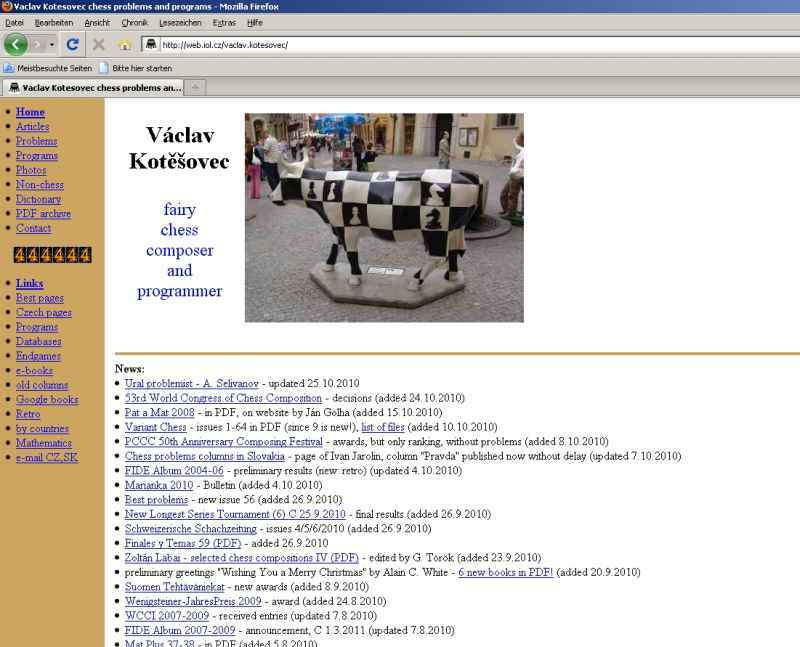 Úloha byla reprodukována 1.12.2008 v soutěži Q.E.D. 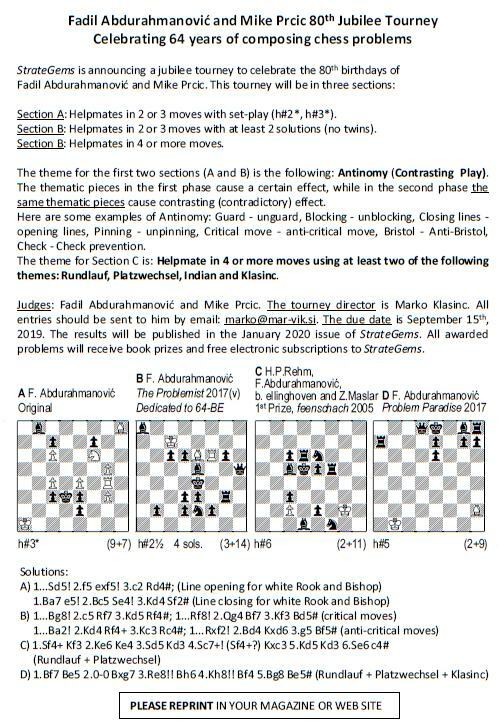 Grasshopper Tours - English summary about "Hopper Tours" by John Beasley (Variant Chess 61, July 2009, p.115). 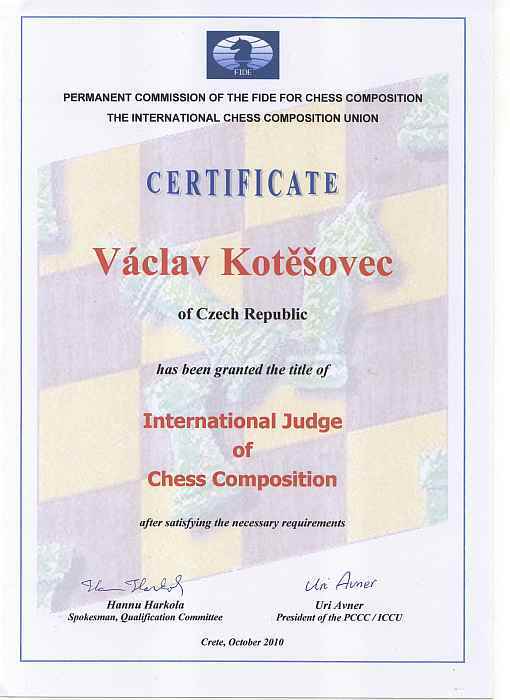 The book is devoted to the question of the number of arrangements of non-attacking chess pieces of the same kind on chessboards of various sizes and types. 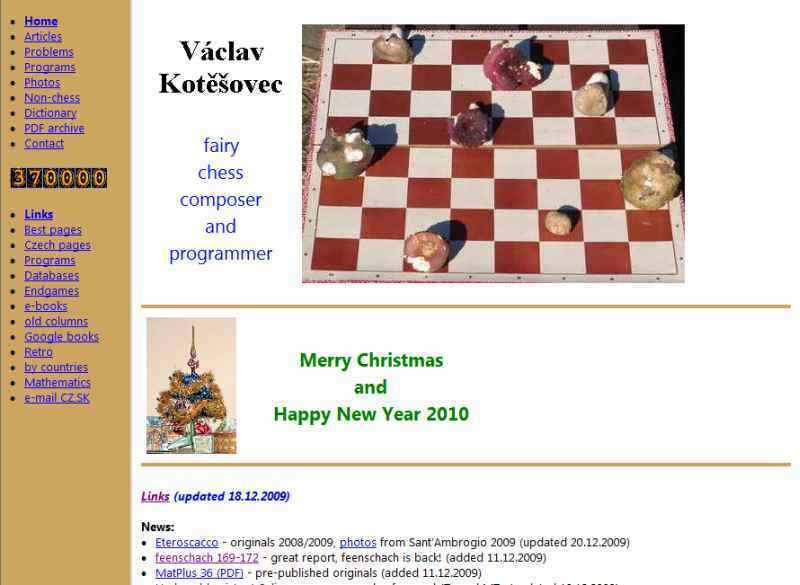 The best-known example is the n-Queens problem, but this publication has a much wider range and includes other chess pieces (kings, rooks, bishops, knights) and many fairy pieces. 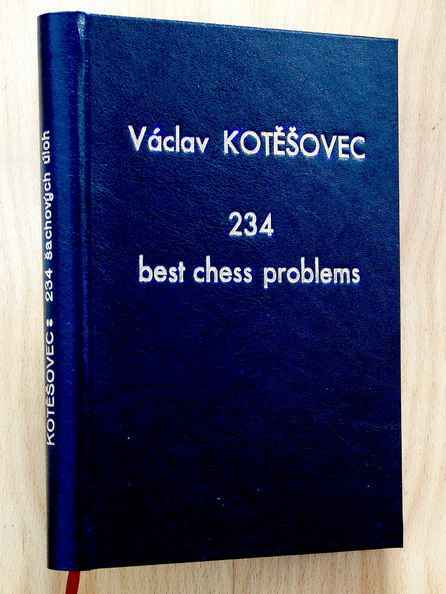 Even though the book is about chess and each problem can be placed among chess-mathematical problems, it will be more readily understandable by mathematicians than by chess players or composers. A partial knowledge of linear algebra, difference equations, generating functions and power series is necessary. Enumerative Combinatorics, Richard P. Stanley (vol. 1, 2ed, 2012, p.558 and 538, exercise 41). A q-Queens Problem, I. General theory - Seth Chaiken, Christopher R. H. Hanusa, Thomas Zaslavsky, Electronic Journal of Combinatorics, 21 (2014), no. 3, Paper P3.33, 28 pp. What is an answer? — remarks, results and problems on PIO formulas in combinatorial enumeration, part I - Martin Klazar, 11.9.2018, p.19, 38, 40, 46, 47. A class of symmetric difference-closed sets related to commuting involutions - John M. Campbell, Discrete Mathematics and Theoretical Computer Science, vol. 19:1, 2017, p.4, 7. Enumeration and Asymptotic Formulas for Rectangular Partitions of the Hypercube - Yu Hin (Gary) Au, Fatemeh Bagherzadeh, Murray R. Bremner, 3.3.2019, p.10, 27. Too many errors around coefficient C1 in asymptotic of sequence A002720 - I found bug in program Mathematica! (added 28.9.2012) Update 25.7.2015: This bug was fixed in version 10.2.0.0 / July 2015. 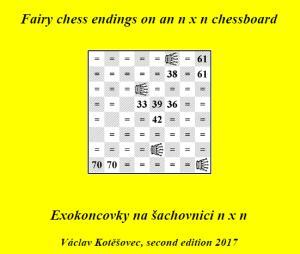 Fairy chess endings form relatively the least explored branch of chess, and always offer the possibility of great discoveries. This book follows on from my earlier articles, and presents new results which can be used in fairy studies. I have created my own "tablebases" for fairy pieces and for square boards of various sizes. 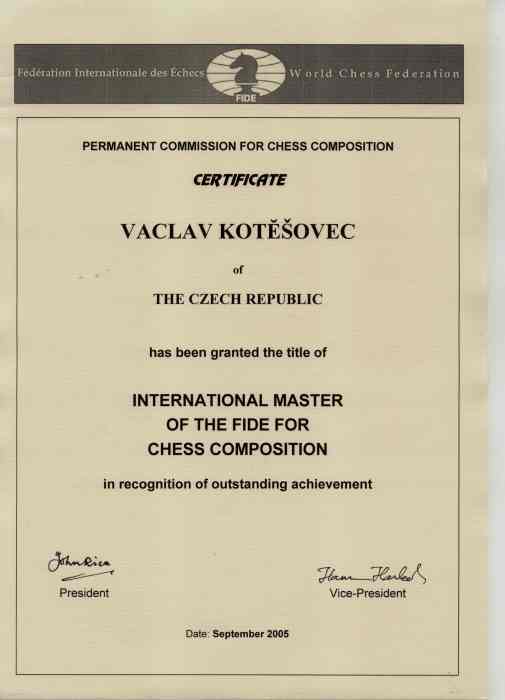 First edition was published 19.7.2013. 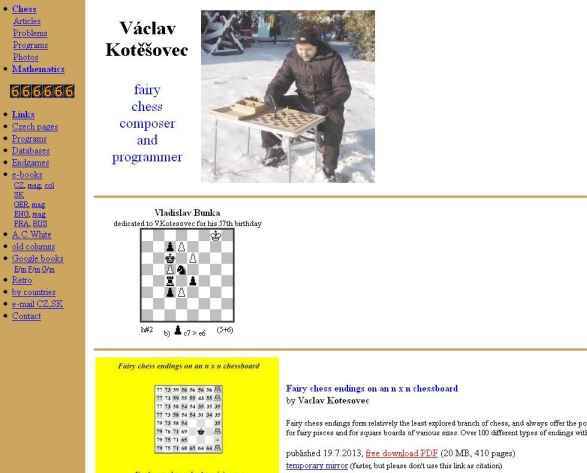 On the computer with 128 GB of memory was it possible in 2017 to analyze with my program VKcomposer 5.0 new series of endings with fairy pieces. Over 225 different types of endings with 3-6 pieces were analyzed. The second edition contains 2310 diagrams, 54 tables and 88 graphs. In total, my computer was generating new endings during a period of over 8 months (24 hours per day). A new and very interesting chapter in the second edition covers endings without the white king. The group of five-piece endings with king + three leapers of same value against a bare king was extended. 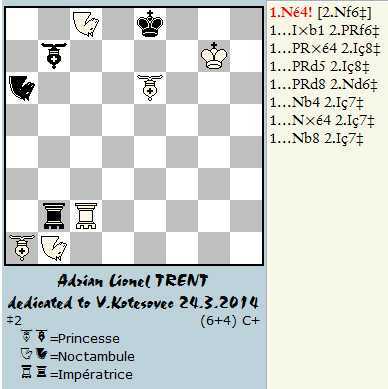 From the new results as an example: The ending of king + zebra + nightrider against bare king is won for the stronger side on boards up to 28x28 (where the longest win has 631 moves!). On boards of 29x29 and greater the ending is drawn! šach! (+) check! Schach! échec! shakki! 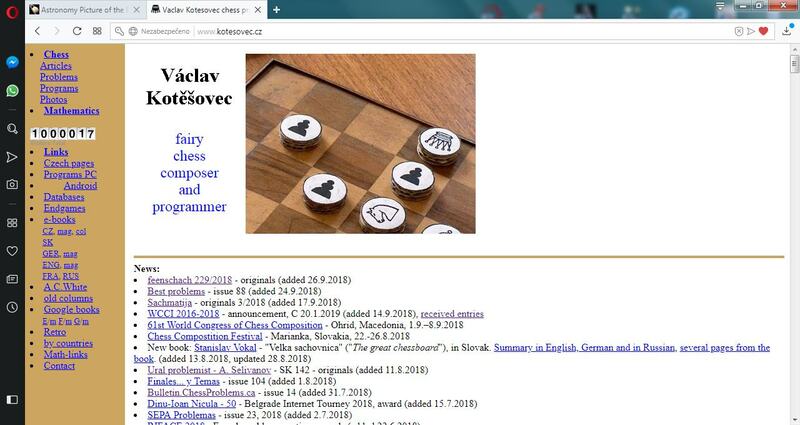 8.6.2008 - test for broken links, many links deleted, many marked as "broken"
8.8.2011 - famous chess columns from the newspapers "Narodni Politika" and "Narodni Listy" 1898-1940 added. 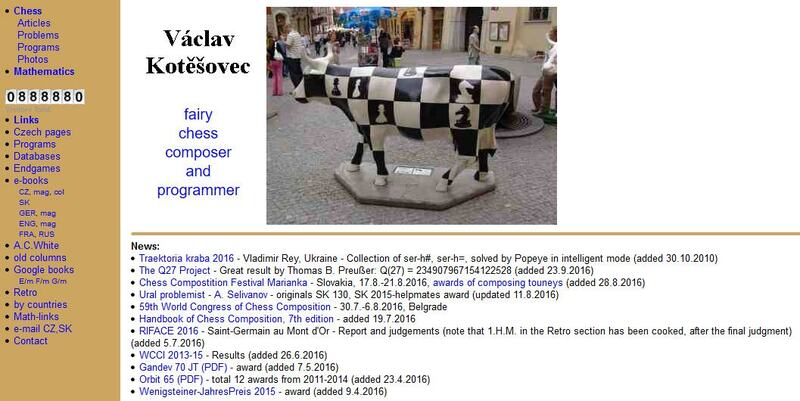 31.7.2015 - my book "Non-attacking chess pieces", 6ed, downloaded (in period 2013-2015) 20842 times!